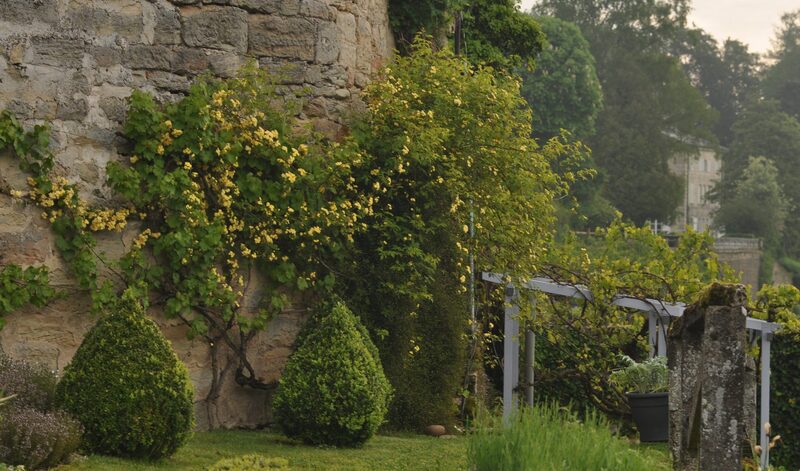 This site is called ‘Garden Dreaming at Chatillon’, but I never really write about the main dream. Today, when the dream seemed so far away, I refocused and pondered whether or not I actually needed some help in the garden. Tulip ‘Sweet Impression’. Still flowering since planting in autumn 2014. Definitely a ‘stayer’. Since I was about 26 years old my biggest dream has been to have a very large, very beautiful garden and to share its beauty with other people. Sad, I know, but that’s kind of the way some of us think. That dream led me through endless evening classes in London, jobs in parks departments and finally to RBG Kew, where I did rather well. Narcissus ‘Peeping Jenny’. I add to them every year. Ok – there were other dreams too. I wanted, for instance, to be an excellent flautist (now I am the worst flautist in the local orchestra). I also wanted to be a passing good artist (I love it, but find very little time to do ‘the work’). I also dreamed of playing the violin (I still do, but the cats leave the room). News today! Narcissus poeticus ‘Actaea’ is flowering. So sweetly scented and one of my favourites, but later this year with the cold weather and rain. That’s life, isn’t it: if you don’t dream and reach, what are you? I’m about 1 and a half months behind with work in the garden at the moment (there are very good reasons, but I won’t bore you with details). The veg plot is a mess. But there are broad beans, and soon there will be peas! And it’s going to be open to the public for the first time on Sundays May 27 and June 10 under the Jardins Ouverts scheme here in France. Today I looked at the garden and thought: how can you possibly say that this garden is worth looking at? It’s a mess! Sometimes I think it looks a bit like a four-year-old’s drawing of what a garden should be! The steps by which visitors will enter the garden. The hazel at the bottom of the steps needs a close eye kept on it – otherwise people will feel less than welcomed! Moreover, since I now write a monthly column in an Anglo-French paper called The Connexion, I have a very small reputation to keep up. Ok, so I am a trained horticulturist and I do know what I’m talking about. But it’s starting to feel like ‘don’t do as I do, do as I say’. The Hornbeam Gardens, where I was working today. Weeds – and scarce a delphinium in sight! The geranium and grass border in the Hornbeam Gardens is now overrun by weeds and Saponaria officinalis. I was attracted by the knowledge that the National Trust still clean their fabrics using a solution concocted from this plant. I had no experience of its desperate tendency to run – and only the odd tapestry to clean. My little Magnolia stellata still braving it out on its weedy bank. Another slope in our garden planned to be ‘managed’ with thick shrub plantings … cough, a natural planting? So pleased that the cowslips like us – they are early this year, I think. So, what I think I need is something called a ‘WWoofer’. The daughter of my Canadian cousin introduced me to this idea when she stayed with us in 2015. She was working her way around Europe, mostly cooking (magnificently) for other people on organic farms. WWoofers are young people who travel round organic smallholdings and are given bed, board and ‘knowledge’, in exchange for their physical labour. When she spoke to me about the concept, I really didn’t take it seriously. Now I’m tempted. Any WWoofers wanting a month in north-east France apply here! In the midst of everything I did still manage to replace my hazel clematis supports in the Rose Walk. Not bad – the previous lasted 3 years and I would have spent a lot of money on something that rots just as fast as the hazel I already have growing here. The delphiniums of the title are another dream gone bad. I have spent so much money on them since the Bon Viveur forced this passion on me about 3 years ago. They have systematically died away after giving their best. His was a passing whim, but now mine is a real addiction. Long nights over the winter trying to work out why I lost them. The answer is probably that I’m growing (or rather, buying and killing) the ‘Pacific Giant’ series that were bred in on the west coast of the States in the 20th century. They were specifically bred as biennials/short-lived perennials. Which is why they are much cheaper than your standard Blackmore and Langdon type. So, having established that I am buying cheap, short-lived delphiniums, what’s the next move? The greenhouse is just grand (although not properly set up yet) and I finally have seedlings germinating that will not be lop-sided. Annual lupin ‘Blue Javelin’ making a dramatic showing today. … and to invest in some seed of a new New Zealand strain which is bred to be truly perennial. (I could also invest in Blackmore and Langdon plants – I may still! – but it would set me back about £70 for 6 plants, including delivery to France). So, I now have two packets of seed from the ‘New Millenium’ strain (‘Super Stars’ and ‘Pagan Purples’), courtesy of Jelitto Seeds in Germany. Gone are the days when I used to pride myself on not losing plants! What’s your dream – and do you have any tips for keeping the dream alive when all seems lost? This entry was posted in Delphiniums, French gardens to visit, Garden development, Greenhouse, Hornbeam Gardens, News at Châtillon!, Propagation, Thoughts, Tulips and tagged Delphiniums from seed, Euphorbia characias subsp. characias, Euphorbia x martinii, Jardins Ouverts, Lupin 'Blue Javelin', Magnolia stellata, Narcissus 'Peeping Jenny', Naricissus 'Actaea', Primula veris, Tulip 'Sweet Impression', Tulips praestans, Uses for hazel on April 8, 2018 by Cathy.